One large piece of meat! This is great to serve for a dinner party. It cooks all day (start it in the morning and you can basically ignore it) at a very low heat. When we have leftovers, this pork (pulled apart) is PERFECT for carnitas tacos. 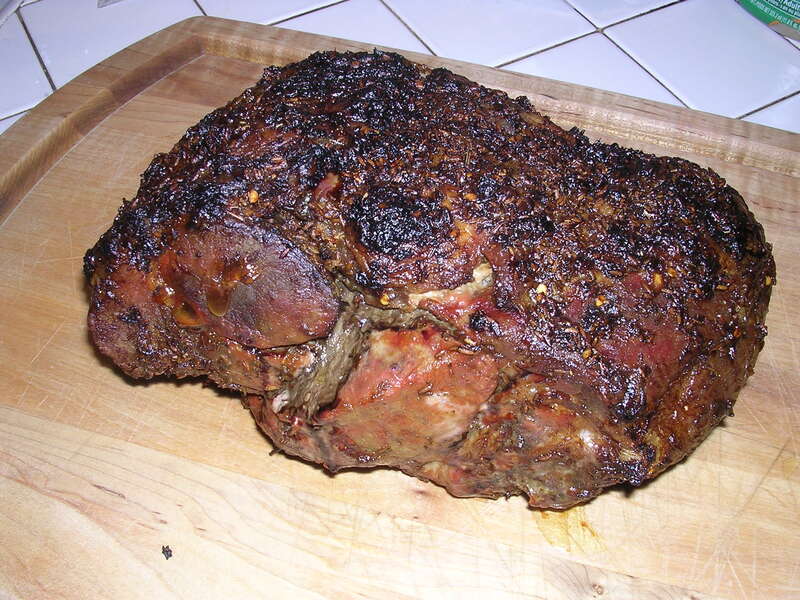 It is inspired by Bruce Aidell's Book of Pork cookbook, the slow-roasted picnic shoulder with Garlic/Fennel Seed Rub. Make the rub by combining the garlic, salt, rosemary, herbs de provence, cumin and red pepper flakes in a mini-food processor. Slowly add the olive oil to make a paste-like consistency. Using a sharp knife, score the pork skin (the marbled fat part, not the meat part) with 1-inch slashes across/about 1/2-inch deep. Do cut cut so deep that you go through to the meat. Thoroughly rub the paste onto the pork shoulder (all sides), making sure to fill the slits with the paste. Place on a rack in a large roasting pan, with the fatty side of the pork facing up, and brush on some lemon juice. Bake for 30 minutes at 450, then turn down the heat to 250 and cook another 7-8 hours. Brush with lemon juice and rotate the pan occasionally while roasting. You can either slice the meat or pull it into pieces. How many does the 6-8 pound pork roast feed?